This year is the 50th anniversary of the death of Daniel A. Lord, S.J. (1888-1955), one of the best-known American Jesuits of the last century. Though now forgotten by many, Lord was a larger-than-life figure in the seemingly confident, cohesive preconciliar church in America. Catholics, especially the generation that came of age during the interwar years, were undoubtedly influenced by Lord’s work. He directed the sodality movement and edited its popular magazine, The Queen’s Work, wrote hundreds of literary and dramatic works and led the crusade to safeguard Americans from immoral films. Born in Chicago, Lord attended Catholic elementary and high schools before beginning studies at St. Ignatius College in Chicago. It was there that he became intrigued by the life of St. Francis Xavier and attracted to life as a Jesuit. He entered the Society of Jesus in 1909 and was ordained to the priesthood in 1923 after more than a decade of study and teaching. Lord’s years as a Jesuit, spanning more than four decades, were marked by his participation in a variety of apostolates, including education, ministry to the young and communication. Fifty years after his death, Lord remains an intriguing personality, in part because of the divergent assessments of his life and ministry. Not always welcomed or respected, he encountered his fiercest opposition from the film industry, where he was seen as a meddlesome priest set on ruining Hollywood. Similarly, Lord was not always appreciated within the church or by his confreres. Among the Society of Jesus’ band of teachers and scholars, Lord was sometimes viewed as a popularizer, who exhibited an anti-intellectual approach to the faith unbefitting a son of Ignatius. Some considered his use of drama and the mass media to communicate the faith a less than noble means for teaching serious truths. Because of his specialized work, Lord’s ministry required him to travel frequently from diocese to diocese, which made him appear at times as a renegade Jesuit and led to the assertion by one American bishop that Lord was an example of the harm that could be done when a priest’s ministry passed outside the control of the bishops. These assessments of Lord’s life and ministry should not, however, be viewed apart from his remarkable popularity as a youth organizer, author, playwright and media consultant. In particular, his wide appeal among young people, long before the days of recognized youth ministry, was without parallel. Lord’s dramatic and literary works testified to the enduring appeal of themes of heroism, virtue and faith and their ability to speak to the young of every generation. During his lifetime he energized and engaged hundreds of thousands of young people by employing music, drama, narrative and ritual as means to spiritual growth. Shortly after his ordination, Lord somewhat unwillingly commenced the work that would frame nearly his entire ministry, becoming director of the Jesuit-sponsored Sodality of the Blessed Virgin Mary in 1925. The sodality, which began as a loose network of student-based charitable and devotional groups often headquartered at Jesuit educational institutions, expanded dramatically under Lord’s leadership, claiming over two million members at its high point. Though it was labeled a dying organization before his involvement, Lord quickly set to work on a national plan for expansion, beginning with a revival of the sodality’s magazine. 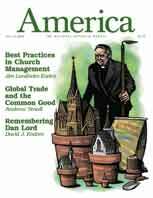 The magazine grew to become a major tool for catechesis and evangelization and had an impact on students of nearly every Catholic school in the nation. Lord’s creativity enveloped every aspect of the movement, including his drafting of the theme song, For Christ the King, which began, An army of youth flying the standards of Truth, We’re fighting for Christ the Lord. Heads lifted high, Catholic Action our cry, And the Cross our only sword. Many Catholics who were in school near mid-century can still recall the tune and its lyrics. Remaining national director of the sodality until 1948, Lord was the chief architect of its growth, the organizational and creative force behind what at one time was the most significant movement of American Catholic youth. Noted for his organizing zeal, Lord was also one of the principal participants in the Catholic literary revival of the early 20th century, which aimed at propagating distinctively Catholic literary and dramatic works. Unlike most of his Jesuit counterparts, who were attracted to a scholastic, intellectual means of handing on the faith, Lord took a popular approach that relied primarily on catchy titles, poems, cartoons and songsthings that appealed to youth by way of emotion rather than strictly intellect. To this end, he began writing numerous pamphlets and articles that drove home the typical themes of Catholic Action: eucharistic and Marian devotion, modesty in dress and conduct, respect for the family and persons of authority, anti-secularism and, later, attacks on the chief ism: Communism. Lord’s writings often had provocative titles meant to capture the attention of young peoplefor example, The Church Is a Failure (1939), Confession Is a Joy (1933) and Don’t Marry a Catholic (1952). His fresh style won him many followers who had only to look to their parish’s literature rack for his latest installment. Not including letters, it is estimated that he penned an average of 20,000 words per month over the course of his 35-year ministry, totaling at least eight million words. By the time of his death, Lord had written 90 books, nearly 300 pamphlets and countless articles. His works had sold over 25 million copies by the 1960’s, assuring that Lord influenced most American Catholics educated in the first half of the 20th century. In addition to his literary output, Lord was known for creating and directing elaborate pageants that often involved hundreds of participants. An accomplished pianist and teacher of drama, he created 58 musicals. Relying on local talent with minimal rehearsing, his musical masques blended moral and social lessons with historical themes, often featuring the triumphant medieval crusader as the protagonist. The historian Peter McDonough has called Lord’s pageants the multimedia events of the era. They included Lord pounding away at the piano, spotlights turning from one end of the proscenium to the other and much flapping of drapery and theatrical gowns (Men Astutely Trained). Lord took his pageants on the road, from city to city, directing his plays in sold-out venues. Lord’s interest in drama easily transferred into a fascination with film. He earned a reputation as the Catholic authority on film after serving as a consultant to Cecil B. DeMille’sThe King of Kings (1927), a cinematic portrayal of the life of Christ. Within a few years, Lord became prominent in the effort to censor the content of movies as a backer of the Legion of Decency and author of the Motion Picture Production Code. Though he himself was an entertainer who skillfully used the stage, Lord’s support of film censorship indicated his unwillingness to allow artistic freedom to trump moral parameters. His involvement in the drafting of the production code remains of particular interest among historians and sociologists, perhaps because it is here that Lord’s influence seems most foreign to our contemporary understanding. Fifty years after the death of Father Lord, his is no longer a widely recognized name among American Catholics. Few have taken notice of him in recent years; the last biography of Lord is now more than 25 years old. Perhaps he lacks notoriety at present because he was less a media icon, like Bishop Fulton J. Sheen, than an indefatigable organizer, consultant and directornot the one on the stage or in front of the cameras, but the one behind the scenes. Doubtlessly, people recognized the name Father Lord more rapidly than his likeness, because of the abundance of his publications. Father Lord’s is a life worth remembering, not only because he was one of the most notorious Jesuits of the last century, but because he represents a pioneering vision for the church’s ministry in a modern, media-saturated world. Lord championed a form of public Catholicism meant to compel youth to take their faith out into the world, not to leave it sequestered in churches and schools, safe from spreading. What appealed to a generation of Catholic youth and what should elicit our admiration today is Lord’s zeal to communicate with people using the most effective means available, whether the stage, the written word or the cinema. Lord’s works connected the faith with the experiences and interests of youth, employing modern technology and cultural themes without shortchanging the vitality of the church’s teachings. Lord’s ability to engage and energize youth was unmatched in his time. He made the truth attractive, spoke frankly about the church’s teachings and imparted his message with youthful enthusiasm. Lord’s legacy to this century, then, is not a call for the church to turn back the clock to a bygone era but to use every means to evangelize zealously in the 21st century. Your article on Fr. Dan Lord revived pleasant memories of his influence on me in my adolescent years. In 1951 to mark the occasion of the 250th anniversary of the founding of the city of Detroit, he directed a musical he had been commissioned to compose. If memory serves, it was entitled "Light Up the Land" and was performed with a cast of several hundred for 10 nights in the football stadium of the Jesuits' University of Detroit. I was enthralled with the multi-level stage, the special lighting effects, and the story he told with numerous songs--all original. The following year he returned to Detroit with another original musical, this one to celebrate the 75th anniversary of the University itself. Local high schools were invited to participate. As a sophomore I signed up with other boys from the local Jesuit high school. In troubadour costumes, we appeared in one scene holding trumpets (the orchestra provided the actual sounds). Every night Fr. Lord gave the entire cast a pre-curtain pep talk which I never missed. He also visited Detroit several years for the Summer School of Catholic Action. My sister and I then learned "An Army of Youth," which we still occasionally sing together. Having been so impressed by him in person, I read many of his "Queen's Work" pamphlets and books. After high school, I entered the Society of Jesus in 1955, the year of his death. About that time, his autobiography, "Played by Ear," was published. I got special permission to read it--it was not yet among the books made available to us novices. Needless to say, it was a great read then and again a few years ago. What a uniquely great priest! I just saw the article about Father Dan Lord. The Sodality and Summer School of Catholic Action were great influences on me in my high school days. They are the underlying foundation of my present Catholicism. The Jesuits who taught at the SSCA were brilliant men, who, I thought at the time, were extremely generous to be wasting their intellect and time on high school kids. Thank you for the excellent article “Dan Lord, Hollywood Priest” (12/12). David J. Endres brought back such precious memories for those of us who knew Father Lord from the Summer Schools of Catholic Action, from his pamphlets and his books. I still treasure “The Song of the Rosary,” written in 1949. Yes, we were the sodalists who sang (and can still sing) “Mother Beloved” and “An Army of Youth.” It is great to know that Father Lord is not forgotten. While he may have been misunderstood by some, he was truly understood by those of us who loved his messages and have endeavored to live them these past decades. Anyone interested in doing a metanalysis of Dan Lord's music? I would like to put together a collection of his "Beloved and Best Music." Perhaps offer alternative lyrics to update his vocal works, but also retain the original lyrics for reference. Include some of his instrumental pieces, e.g. "In and Ursuline Garden." I would like to write a Christmas Tryptic featuring his "Christmas, now that's for me," "Sweetest Babe," Merry Christmas, God Bless us." Compose a short play or skit with this music nested in the narrative. Perhaps include a "traditional carol" and some modern piece that best expresses Lord's spirit, genre and timbre. Discussed with with Fr. McNaspy at Loyola in NO; we were working on a grant but he passed and I have not followed up. Lord's omnia opera, I believe is in the Jesuit archives at St. Louis U.Sheet music, records, etc. Anyone into popular Catholic music/evangelization, etc.,to do do a dissertation or thesis here? Hope I am not alone, We need to resurrect the best of his music and give it some contemporary spin versus have his works shelved away. Why not a movie about Lord's life and work. "The Song of Bernadette," won an Oscar in 1943, my DOB, or thereabouts. Any takers or shakers. Lord shook up things. May his spirit live on. A beautiful commentary on a wonderful priest. I was born after dear Father Lord passed away, but have stumbled upon him through his writings. From his little pamphlets marked The Queen's Work to books such as My Mother, The Parental Guidance, and Played By Ear, I have learned how to live the Faith in a practical way. His common sense approach to teaching the Faith and inspiring Catholics is in dire need today, especially after Vatican II has left us a virtual desert. I pray someone will reprint his works because Truth is never outdated. (I also have a question about his one brother: What ever became of him? Fr. Lord doesn't say much about him in his autobiograqhy) Also, I have given many people his aritcle Cancer My Friend which described his reaction to the news that he had cancer. Its focus on the blessing to be given time to prepare for death is truly inspiring. He wrote the book Letters to My Lord before he died and this too is remarkable. Two days ago I attended a funeral where Fr. Lord's "Mother Beloved" was sung. My forty year old daughter had never heard it before while I sang every word. Fr. Lord has been on my mind since. I read "Playing by Ear" in 1958. After reading this article, I long for a return to his teaching and his methods of proclaiming the Word. Yes it was a more innocent time, but it was a good time. The words of "To Christ the King" flow from my lips as easily today as they did in 1955. Many say Vatican II opened a window to let fresh air into the Church. It was a gale force wind that blew an awful lot of good stuff away to our detriment as Catholics. I always remember Fr. Lord's pamphlet, My Grandfather was a Minister. Daniel used to visit his grandfather, Rev. Daniel Key Lord, in Warren, Herkimer County, New York. He was in Chicago in 1870, his three children having been born in Warren, NY. In 1880, he was back in New York with his wife and son James. Father Lord said that his grandfather would concentrate on one hobby each year whether it was scientific, animal life, language or whatever. I had the feeling that he learned to pay attention to life much as Thomas Aquinas did, that the body was meant for the soul and the soul for the body, that nothing is in the mind that is not first in the senses. Humane, hopeful, alive, rational, cheerful. When Vatican II came along, that breath of fresh air was welcome. It blew away the cobwebs of compulsion and obsession. My parents had a very large collection of books - old and new - which I loved to read growing up 20 years ago, among them some of my favorites were by Fr. Daniel A. Lord: "People you'd like to meet", "That made me smile", etc. He was a great author and a significant figure in the Catholic Church in America, and should be remembered. This article also appeared in print, under the headline "Dan Lord, Hollywood Priest," in the December 12, 2005 issue. David J. Endres is a seminarian of the Archdiocese of Cincinnati and a doctoral candidate in the School of Theology at The Catholic University of America, Washington, D.C.